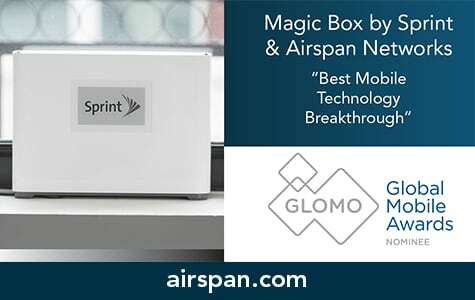 The Magic Box by Sprint and Airspan Networks is the world’s first all-wireless small cell. Magic Box requires no implementation, labor, or rental costs that are a hurdle for many traditional small cell deployments. The unit is simply placed near a window and plugged into a power outlet. The Magic Box, simplifies network densification by using LTE UE Relay for wireless backhaul, by connecting to macro sites at cell edge it decongests overall network traffic. Within minutes hard-to-reach indoor coverage holes are eliminated, and customer’s download and upload data speeds improve on average by more than 200 percent.